CSS Naked Day is tomorrow, April 9th. Being an advocate of web standards, I think this is a very cool (albeit not well-known) event. You can read more about it at http://naked.threepixeldrift.com/. I wanted to participate this year, but the only WordPress plugin for CSS Naked Day I could find was several years out-of-date (and therefore wasn’t fully compatible with the latest version of WordPress and used some WordPress coding practices that are no longer encouraged). Therefore I decided to create an updated plugin with a few more options based on that work. Download my JAM CSS Naked Day plugin. You can then unzip the files and add them to your WordPress plugins folder (wp-plugins/JAMCSSNakedDay/) or use WordPress’ built-in plugin installer to upload the zip file. 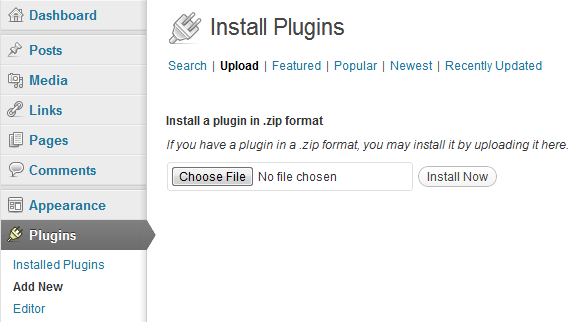 You can upload the zip file to install the plugin using WordPress' built-in uploader. 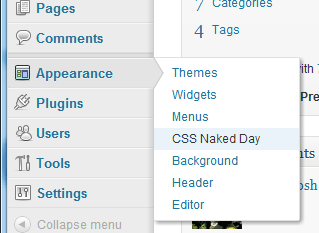 Once the plugin is activated, you’ll see a CSS Naked Day page under the Appearance menu. A CSS Naked Day menu item will be added to the appearance menu. You can specify a few options for the plugin, including a preview options that lets you (or any logged in administrator) view your site without CSS. You can set several options for the plugin to suit your preferences. By checking this box the plugin will be active for any logged in administrators, regardless of the date. You can use this option to test how your website will look on CSS Naked Day. I think this is also a good method for checking your theme to see if it uses standards-based, semantic markup. CSS Naked Day takes place on April 9th, but depending on your time zone that day actually covers a 48 hour block of time around the globe. You can choose to only remove CSS for your website’s local time zone or for the full 48 hours so that all time zones will see your naked website for at least the entire day.